What Can I Do If My Windows Are Frosting Up? Why are my windows fogging up in winter? What did I do wrong? As it gets colder out, people may notice that their windows are icing up on the inside. This can be a frustrating situation because you can’t seem to defrost them or get rid of the ice – it just keeps coming back. There might be days that you may not even be able to see out of your windows at all. There are four main causes to windows frosting up in your home: temperature, humidity, the quality of the window installation and air circulation. Ever noticed that it doesn’t matter how hot it is in the summer, your windows never get any condensation on them? That’s because warm air can hold a lot of moisture – so it doesn’t stick to anything – it just floats around in the air, happy to be suspended. However, drop the temperature a bit and you might notice that your windows will fog up – drop it a lot and they ice up completely. The colder it gets outside, the more likely your windows are to fog up and if it’s cold enough, they’ll frost up no matter what you do. This is the same situation that causes car windows to frost up in the winter. Warm air during the day has moisture in it and as the air cools, the moisture leaves the air and sticks to any surface it is touching allowing them to fog. Just because your house is warm doesn’t mean your windows are – but more on that later. Well this one you can’t fix. The temperature is what it is outside. But read on to learn more about the factors that you can control. A good example of how humidity causes condensation in every day life is on the bathroom mirror. After a shower, a bathroom mirror is often fogged up. That’s because the humidity in the bathroom is off the charts, the air just can’t hold onto the moisture anymore – so it sticks to the walls, the mirror, the shower door, everything. This level of humidity is not going to be found in the rest of the house, but in the bathroom when a hot shower has been running – it’s a foggy situation. Any water source in the house has the potential for evaporation, and consequently, high humidity and condensation on your windows in winter is the result. Plants give off moisture during the evening and watering the plants means pots of moist soil that can release water into the air. Swimming pools give off a huge amount of moisture as do hot tubs and fish tanks. Cooking and steaming things on the stove also produce moisture and of course showers and baths will release a lot of water vapor into your home’s interior. So in the above chart, you can see what your windows can handle for humidity before they start to ice up. Triple glazed windows can handle a fair bit more humidity than double glazed windows. Windows that are older sliding units that have two sets of panes cannot handle much humidity at all and will likely ice up at some time during the winter no matter what, and single pane windows are pretty impossible to keep clear. If you live in Edmonton and don’t have at least two panes of glass between you and the elements, it’s time for new windows. 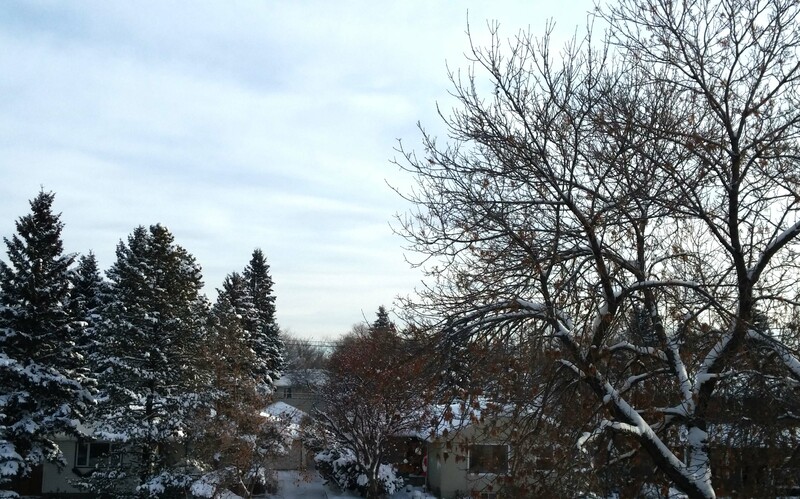 For more on condensation, see this publication from the City of Edmonton. There are other things that add humidity to the house besides your furnace humidifier, however. Here are some specific things that can contribute to higher humidity home. For example, if you vent your clothes dryer into the home instead of outside, you’re going to have a large amount of humidity inside that you wouldn’t normally have. This can be fixed by running ducting outside your home and having all dryer air and moisture removed from the home. If you can’t get ducting to the outside, you can install an exhaust fan to try to take most of the moisture out. A lot of every day humidity in a home comes from cooking and showering. (Think about boiling a pot of water and how much humidity that creates). Also, showers create a lot of moisture – often enough to fog up the mirror in the bathroom, right? Some of that moisture is going to make its way to your window. So run your hood fan in the kitchen when cooking and always run your bathroom fan when showering. This can help reduce humidity before it gets a chance to migrate over to frost up the windows. If you do this, you’ll probably solve most of your everyday frosting issues. If your humidity is coming from a swimming pool, you can cover the pool when it is not in use or install a dehumidifier in the pool room or reduce the temperature of the pool water – covering and lowering the temperature of the water will keep more of the water in liquid form instead of it becoming vapor and travelling to the windows. There isn’t really anything else you can do, that pool water is going to keep getting into the air and sticking to the windows. Pool areas are notorious for having fogged up windows – whether they are in commercial areas or in someone’s home. And hot tubs are the same – only worse. A hot tub should be covered any time it is not in use. And triple pane windows are recommended for any pool or hot tub areas. And when it comes to commercial style framing for windows (the aluminum storefront type) always make sure the aluminum is thermally broken otherwise it’s going to attract a heck of a lot of moisture and ice up very quickly when the temperature drops outside. It should be noted that there are sometimes reasons to keep the humidity high in a house in winter. Being dry in the winter can sometime feel uncomfortable for the occupants – especially at night. And furthermore if you have a hardwood floor, letting the humidity drop too low will make the floor shrink and get creaky. This should return back to normal when the humidity rises, but it does have the potential for causing cracks or splits in certain floor boards. So balance the need for drier air with your own need for moist air and you house’s need for humidity for it’s ‘woody’ components. The last situation that can occur to make windows fog or frost up in the winter time is poorly installed windows. If insulation is not properly installed around the windows and they are just trimmed up with an empty cavity surrounding them, cold air will leak in around the window making the glass very cold on the inside where condensation will become ice. Another window quality issues is worn out weatherstripping that allows cold air to infiltrate the window area and to make the glass cold enough for water to condense on it. Poorly sealing windows can allow cold air to blow right across the pane of glass. This insulation issue is something that may be easily fixed with some spray foam or even batting insulation stuffed in the void between the rough opening and the window casing. Check with your window installer to see if this has been done, or if you’re handy and feel like doing a little checking yourself, you can gently pry the window trim off and take a peek inside to see if the windows have been properly insulated around. If they haven’t, it’s a pretty cheap fix. If they have, well then you have other issues and might want to start back at the beginning by checking your humidity levels in your home or seeing if the weatherstripping is not doing its job. If your weatherstripping is old, consider replacing it. It might not only keep your windows from frosting up, but also save you some money on your heating bill! The last issue concerns window treatments or coverings. If you have heavy drapes, blinds or shades covering your windows, you’re going to trap cooler air near the glass. This means when moisture sneaks back there and is trapped with the cold air, it’s going to stick to the windows. 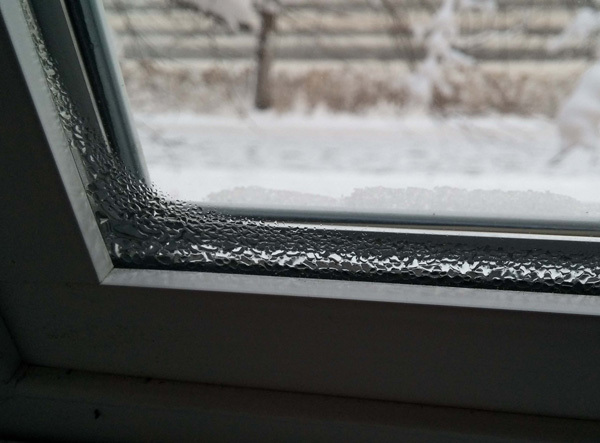 As an aside, this is also one of the quickest ways to ruin your window trim because the ice that forms on the glass will melt when the sun comes out and run down, sitting on the sill and peeling the paint or and rotting the wooden trim or even the windows if they are wood windows. Simply open your blinds and let the air circulate through to warm up your windows. Ever noticed how heat registers are located in front of windows? Well that’s partly because windows can be a bit drafty, but also it keeps air flowing over the glass and keeps those windows frost-free. Here is some condensation on a window that had the blinds closed all night. Other windows that had the blinds up did not have this issue. Maybe you don’t think it matters if your windows fog up. Well that depends on what kinds of windows you have. If you have a window that is all PVC (vinyl), then not much will go wrong with it, you’re just going to have icy windows. And aluminum windows may be perfectly fine too – depending on what kind you have. But if there is any wood around your window (and let’s be honest, your entire home is probably made of wood) then you can end up with a rotten window sill or trim by not taking care of your moisture issue. Remember, water is what really wears out houses, so you have to keep things dry at all times. Rotten window sills and trim look ugly and will have to be fixed because rotten wood can be structural problem, eventually. Your windows may sag or even fall out if your sills are rotten – I have seen it happen! Speaking from personal experience, we used to have windows that iced up so much that we couldn’t see out of them for about four months of the winter. This is pretty annoying when there is not much sunlight in the winter as it stands and much of it was being blocked from coming in the windows. Not cool. For us, this was a combination of old windows letting cold air in, high humidity in the home and very cold temperatures outside – we do live in Edmonton after all.So we got new windows. They’re nothing special by today’s standards – but they’re 40 years ahead of the ones we had – and window technology has come a long way. And do they ever make a difference. We have no problems with our windows icing up now, so I know that they were installed correctly and are a good fit for our house. It has been 30 below 0 (that’s -22 Fahrenheit for y’all down south) and there has not been any icing up around the windows at all. A simple fix, and actually not a very expensive one – and we have a lower heating bill by a large margin now as well. It was really a win-win window situation for us. If you have icy windows, it might be something you can fix yourself, or it might be time for new windows – try the tips above and if they don’t work and you have to go the replacement route, see 7 Things To Consider When Replacing Your Windows. Very good article! Just a few questions: did you mean like moisture is not very good to the windows? Like when it sticks on to the window it probably freezes up and becomes ice right? Moisture is not usually good for anything that isn’t supposed to get wet, but that really depends on your windows. Moisture will eventually ruin wood windows by flaking paint and splitting the wood or even causing rot (not such a huge problem indoors in Edmonton, but it is other places. If your windows are aluminum or vinyl, the moisture isn’t really going to do any damage, though – it just looks bad to have iced up windows. You want to be able to see out of your windows and ice covering them is frustrating. So it might be fine for the windows to get frosted up unless they’re wood windows. For other parts of the window besides the frames, moisture could damage the seal or weatherstripping on moving windows by sticking the two surfaces together so that when you do try to open them, the weatherstripping gets torn. Then you would have to replace the weatherstripping more often. That is an issue I have seen with door sweeps and weather stripping on windows. I hope that helps. Thank you for the article. I have a question for you. I have a vinyl window in which yellowish water is trapped in between the panes. It is inside the window. Will it harm my window? How to get rid of it? Do I need to repair or change my window? I am really worried about this and any tips/help will be appreciated. If there is water trapped between the panes of glass, it means that your sealed unit is no longer intact – that is the seal is blown and moisture has gotten in. There is nothing you can do to clean that stain. Some companies can inject a desiccant to absorb the water, but it will only be a temporary fix as more water will enter through the broken seal and re-stain the window. The only solution is to replace the sealed unit. This doesn’t mean replacing the window entirely, but just the panes of glass. New panes will be clean and sealed together and look brand new. This isn’t a hard job and is cheaper than getting new windows for sure. All the being said, there is nothing ‘wrong’ with water being between the panes. It doesn’t look that nice, but those windows will still insulate more or less the same as brand new. You won’t save on heating or cooling bills by changing the sealed unit – you’ll just have a clearer view of the outside. To get this done, you should be able to call a local glass shop and ask them to quote you on a sealed unit. Just look up “glass repair” online – there should be a Speedy Glass that will do residential window repairs nearby – they should know what you’re talking about. If they want to sell you new windows, talk to someone else. And make sure to ask them to be careful not to break the window stops (framing holding the window in) when changing the unit – these can be very hard to find replacements for. I bought my house in aug. I’m in St Paul Mn. I’ve noticed now that it’s about -5F out some of my windows have condensation at the bottom like your picture, while the very one next to it doesn’t have any at all. They appear to be newer. They are vinyl double pain. My Aprilaire says I have about 30% humidity in my house so I don’t think it’s that. Any ideas? If the windows are identical, then there must be something about the installation that is different, or the airflow around the window that is different. I would recommend that you check to see if there is anything blocking airflow near the window with the condensation (curtains are an obvious issue), or if there is a heating vent nearer the window that is dry. Also, you might want to feel around the windows to see if there is any cool air blowing in around the window. Perhaps there is missing insulation somewhere and that is allowing the glass to get colder. Good luck and thanks for reading the site! I bought a home in Winnipeg in Aug 2017. All windows are vinyl aluminium and are all new and its a newly fully renovated home everything renovated and new. I have exactly what your pics show. My concern is that i have checked the windows are insulated properly (i think). I do have heavy blinds and most of the vents are by the windows. I am worried as i have a dehumidifier and still has this every single day. its winder and its always (-10 and dips more at night). It forms ice now inside and I am worried. What can i do ??? Hi Ernest. Without knowing about how the insulation is around your windows and how your windows are constructed, it’s impossible to tell what the issue is. Vinyl windows are usually just made of vinyl unless you have an aluminum extrusion on the exterior as well – but that won’t likely make a difference. If the home is renovated, not everything is new. You may have an issue with insulation or the sealed units may not have a spacer-bar that is insulated – basically the cold is getting to the glass on the inside somehow. You’ll have to get an expert in to troubleshoot the problem. If you didn’t own the home when the renovation was done, there is no telling what was missed during the installation of the windows – if anything. Besides that, your home may still be too humid. You can follow the suggestions in the article on reducing humidity for those issues. Troubleshooting my rental space. Landlord stated not to open windows in winter due to heating system. My question is, where is the heat? Basement suite is cold with the temperature turned up. Now i read it will cause extra moisture. Not good to freeze but don’t wish for poor heating system . So frustrated. Opening the windows in the winter is certainly not going to help with your heating. I am sorry but I wouldn’t be able to tell you where your heat is coming from. In Edmonton, heating is usually from a forced air furnace so there should be vents somewhere. You could also have electric heaters or hot water radiators somewhere. You can see the different heating types here. Other than that, you really do have to direct all your questions to the landlord. It is their property and they know the most about it. I found a product called “indow windows” which are basically window inserts that create additional air space in front of the window to help “insulate” the windows. Do you think this or similar product will help solve condensation problem? Yes, something like this may help keep the warm interior air away from the cold window glass. Also that shrink wrap product can work as well. Just make sure that anything you put on the inside and 1) be removed without making a mess or causing damage and 2) seals tightly so as not to trap moisture between the panes and make the problem worse. Our house was built in 2014. I replaced the window panes myself in 2015 and the problem got worse. Humidity in the house is under 55%, I ran dehumidifiers constantly to no avail. The only thing that helps is window plastic that I put on with a hair dryer in Oct. The HVAC guys want to put in a heat exchanger. I am afraid….very very afraid the HVAC guys will blame the window guys and vice versa. Sure the newer houses are “tight” but I can’t see a heat exchanger working when the humidity outside is higher. Right now it is raining and opening the front door it gets cold everywhere FAST. I am skeptical a heat exchanger will do a better job.